Has your kiddo been thinking with her gut a lot more than her brain lately? Well, there is no need to be alarmed. We believe she has simply joined the growing army of the living dead. Help her look like the scariest zombie with the right costume. 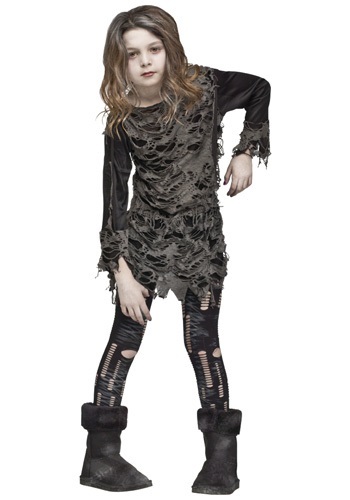 In fact, take a look at this Child’s Living Dead Costume! We think it will be perfect for your little girl to blend in with the rest of the horde. This ensemble is super easy to assemble. It’s literally as easy as 1,2… and that’s it, there’s no 3! She just needs to toss on the tattered black and gray dress and then she can complete this haunting transformation with the included torn up tights. She’ll be the most stylish zombie anyone has ever seen. Of course, if she wants to get plenty of good scares this Halloween then you can easily kick this costume up to the next level. She will just need a ghoulish makeover! Take a look through our collection of makeup kits and pick out the best one, we would suggest one with plenty of fake blood. After all, everyone knows that zombies are some of the messiest eaters! With this costume and a terrifying makeover, she’ll be ready to hit the streets and start collecting treats. Yes, normally zombies prefer a fresh brain or some chewy intestines but we have a feeling your little walker has a bit of a sweet tooth. So we are sure that her stomach will lead her right to the tastiest candies this year!